What if I am not ready to process NCOA? Can I schedule it? You don't have 15 minutes to process a file today, or your data just isn't ready yet. For this reason, we now have a form to schedule NCOA. 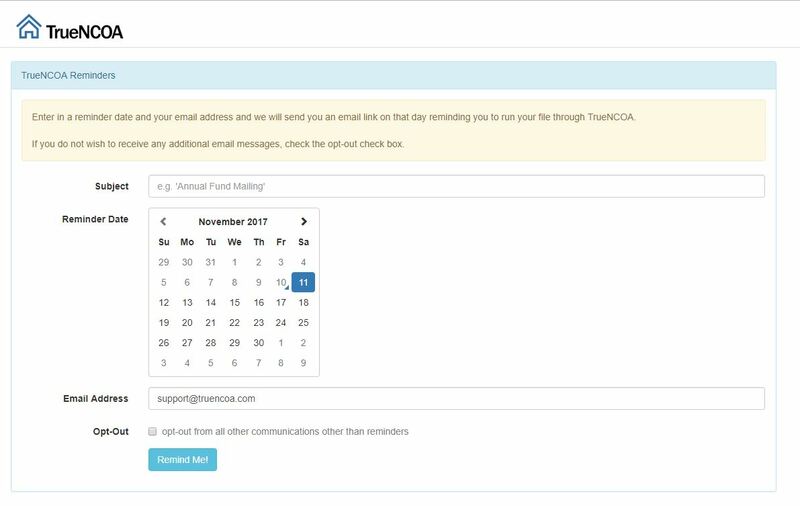 TrueNCOA will send you an email reminder on they day of your choice. Just tell us your email address, the day you want to be reminded, and include a note to yourself in the reminder (optional). Click here to Request a Reminder today. Remember, it is FREE to register and to process files. Start exploring TrueNCOA and get started at your convenience.